There are two differing theories inside the New York Rangers' dressing room when the discussion turns to Chris Drury and his past playoff heroics. Neither has anything to do with luck. Scott Gomez says Drury's positioning and understanding of how to succeed in the moment makes him the NHL's ultimate money player. Jaromir Jagr counters that Drury's talent around the net makes him a playoff phenomenon. No matter what reasoning you subscribe to, Drury's team is the one coming out on top more times than not. To the subject of the discussion -- and now the New York Rangers -- that's all that really matters. "Ultimately it's just being in the right place at the right time," Drury said, offering his own theory as to why he has been able to score 15 playoff game-winners. "I don't look into it too much in depth or try to analyze it. I'm just happy I was able to make a difference for the team on that night." We'll start with Jagr's theory, because as someone whose team was recently victimized by the Stanley Cup Playoff king, Jagr has the experience to offer detailed analysis to back up his assumption. 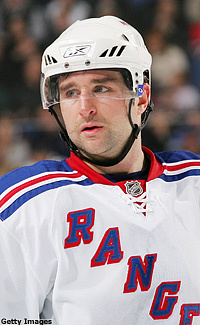 At the time, Drury was playing for Buffalo and his Sabres were locked in a taut best-of-7 series with Jagr's Rangers. The series was tied 2-2 and the Rangers were 7.7 seconds away from taking a three-games-to-two lead when Drury struck with the tying goals. Buffalo went on to win Game 5 in OT and then took Game 6 to send the Rangers home. "I'll explain to you why it's him," a stone-faced Jagr said. "Most of the goals in the playoffs that come late in games are scored in scrums around the net, and his talent is his quickness around the net. That's his advantage. He can rebound twice in the same time some guys can do it only once. It's tough to understand if you never played hockey." We think we've got it. Jagr is saying that Drury's stick is so quick that he'll get two whacks at the puck in the same time an average player will get one. Twice as many whacks, twice as many chances to score. "He's quicker," Jagr continued to explain. "Joe Mullen was the same way, and I think even quicker than Dru. He could do it three times. It's not any magic. It's just talent. And, if you score those goals, they're going to put you on the ice." Gomez offers a more spiritual, mystical theory. "When the game is on the line, or it's a big moment, he's a guy that seems to rise," Gomez said. "He seems to be at the right spot. You can tell he works at it, but, at the same time, you just have to have it." OK, but how do you get it? "One time, I asked him about it, and he said he puts a lot of effort into it," Gomez continued, still not letting us in on what exactly it is. "He works hard at his craft. What can you say, when the game is on the line and you have Chris Drury on your team, there is nothing better." But doesn't having Drury on your team kind of ruin the suspense? "When you're watching him," Gomez answered, "it's just like you know automatically it's going to happen." Well, not every time, but close enough. Eleven of Drury's 26 playoff goals scored as a member of the Colorado Avalanche were game-winners, including four of his six in his rookie season of 1999. He added four more during the past two seasons in Buffalo, including three last season. That total doesn't include the Game 5 goal, which wasn't the winner, but did turn that entire series in favor of the Sabres, who went on to clinch the series in six games. "I'm pretty happy any time it goes in, but in the playoffs it's obviously a bigger stage," said Drury, who also has 43 game-winners in 698 regular-season games. "Everything you do is magnified and as it should be. It's more important." Drury, though, can't tell you when, where, or how he scored any of his game-winners. He probably couldn't describe any of his 43 playoff goals. He's just not a reflective guy. Never has been, even though he's won at least one championship at every level, including the Little League World Series in a completely different sport. "I always just try to look ahead to the next game, next shift," Drury said. "Maybe when I'm done and retired someday I'll sit back and look at them, but right now I can't even tell you where any of them came. Right now, I'm just trying to push ahead." So are the Rangers, who are doing so with the comfort that Drury can destroy a team with one swat at the puck late in a game. That knowledge undoubtedly played a factor in GM Glen Sather doling out the money to sign free agent Drury on July 1. Now, with the Rangers on the cusp of the playoffs, it's time for Drury to repay that faith. There's no theory coming out of that dressing room that says he won't. 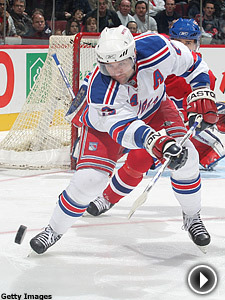 "He helps his teams play postseason hockey," Rangers coach Tom Renney said. "His coaches in the past have felt very comfortable with him under any circumstance. I hope I'm no different."